The highly touted young adult novel Star Wars: Ahsoka has been on shelves for about a month now, and to say it's been popular would be an understatement. The excitement generated by a fan favorite character from the gone-too-soon Clone Wars animated series as the star of a novel led to the book hitting at #1 on the New York Times Bestsellers List in the Children's hardcover and children's ebook categories. But does the book live up to the lofty expectations set by fans? The answer is yes and no. The novel does tell an important story in Ahsoka's development, but it's not the gripping page-turner fans were hoping for. Part of this is circumstance: the book is hampered by the fact that an arguably more important part of Ahsoka's life story is left untold. The book picks up six months after Order 66, and even though the novel's interludes flashback to those events twice, the majority of that story remains untold. With so much mystery remaining, the first half of the novel really suffers. Author E.K. Johnston tiptoes around the background events, and the result is a very slow start to one of the most anticipated Star Wars novels of the year. It's hard to be invested in Ahsoka's suffering when the audience is left so much in the dark about the specifics of her Order 66 ordeal, and those mysteries are never unravelled, even when the story transitions to more exciting parts. The story itself serves as connective tissue between where The Clone Wars should have ended and where we later find Ahsoka during the time of Star Wars Rebels. And there is a lot of really good stuff in there. We see Ahsoka reunited with some important players from the prequels and The Clone Wars (one reunion in particular that manages to be both heartwarming and heart wrenching at the same time). While it may not be the story we really wanted, it is an important one. Unsurprisingly, the best part of Ahsoka is Ahsoka herself. E.K. Johnston did an excellent job at capturing Ahsoka's voice. While it's clear that the character has been through a lot since we last saw her (chronologically) in The Clone Wars, she feels like a halfway point between the Ahsoka we knew then and the Ahsoka we will meet on Rebels. Johnston added a great touch by having Ahsoka imagine what Obi-Wan or Anakin would say, or even speaking to an absent R2-D2, showing how much the character is struggling with her current situation. As in Star Wars: Aftermath, another strength of Ahsoka is the interludes. The first interlude picks up during the siege of Mandalore (the event that would have served as the series finale for The Clone Wars). The opening two words alone should be enough to get any Star Wars fan excited. The other interludes take us on tour of the galaxy during this time, checking in on familiar characters and locations. It will be interesting to revisit the interlude set on Illum after Rogue One has been released. The novel's weakness is its original characters, especially the villains. The Imperials featured in Ahsoka seem as if they shouldn't present much of a challenge to Ahsoka, nor are they particularly interesting on their own. Granted, Ahsoka's real challenge is a mental one--her struggle to reach the point where she is ready to take up the fight again--and the Imperials she comes up against serve mostly to get her to that point. But it never feels as if they present a real challenge to her. Given the adversaries we've seen her go up against--Darth Vader, Barriss Offee, Asajj Ventress--it’s hard to get excited about Ahsoka facing off against unknown, generic villains. 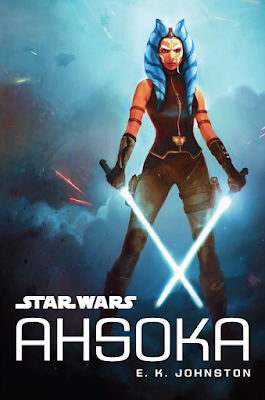 It's hard to be overly critical of the novel given that a key chapter in Ahsoka's life is currently locked away to be told later--a factor that no doubt posed difficulties for the author. But, if we take high expectations out of the equation, the book is fundamentally a solid read, even if it falls short of being great. Fans who have grown to love the character will appreciate the opportunity to spend more time with her, but ultimately Ahsoka is a very by the numbers Star Wars story. THIS is the problem I have with the "new" expanded universe in that the powers that be refuse to tell the stories fans want them to tell. Forget about teasing the fans with "future" stories and tell the stories we want to know about, specifically Ahsoka's story revolving around Order 66 and Luke's life immediately following Return of the Jedi (yes, I know that potentially Episode VIII will fill in part of that, but it most certainly won't be comprehensive).